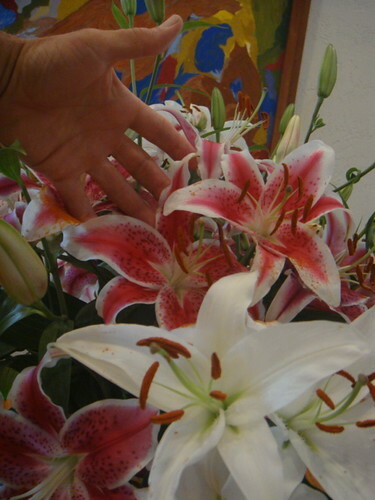 Here is an Ecuador Lily chronology that shows how long Ecuador lilies can last. 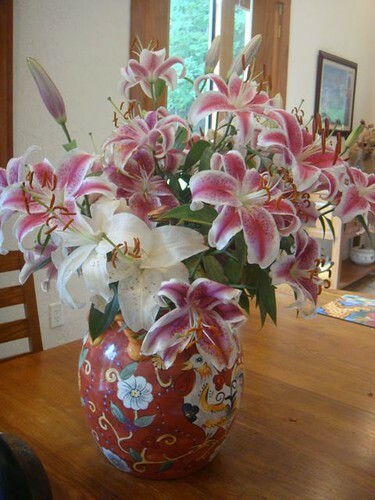 I ordered 25 Ecuador lilies for Merri’s birthday. 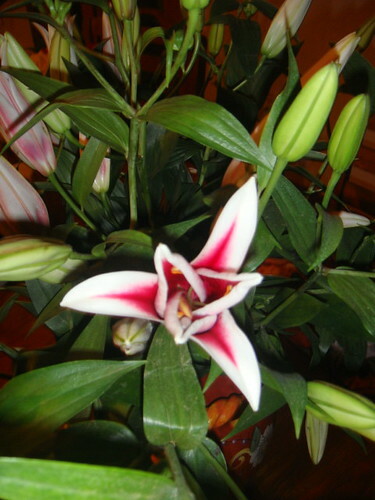 The Ecuador lilies arrived Wednesday, July 29. I placed them on our dining table, in a huge vase. As you can see in the picture above and below the blossoms had not opened on the first day. Also note that each stem has many blossoms… there are about 100 blossoms. There were so many blossoms the vase would not hold them all. I stuck the remainder in a pitcher upstairs, at the foot of our bed. I decided to keep track of how these Ecuador lilies held up. On the fifth day after delivery, many of the flowers have now opened. The aroma was intoxicating…downstairs… upstairs…even outside! Many of the blooms were huge. What a treat going to sleep gently lulled and then awakened by this glorious floral fragrance! 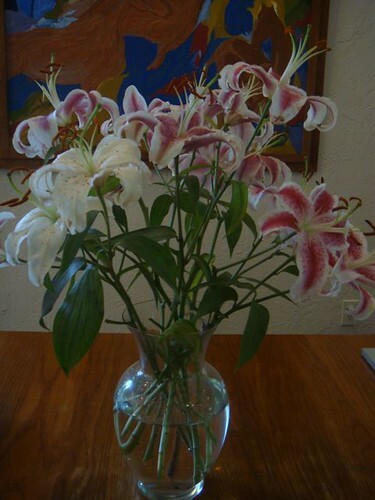 After ten days, August 7, the lilies still looked perfect. Many blooms still unopened. Upstairs too. Six days after that, August 13, most blooms had opened. 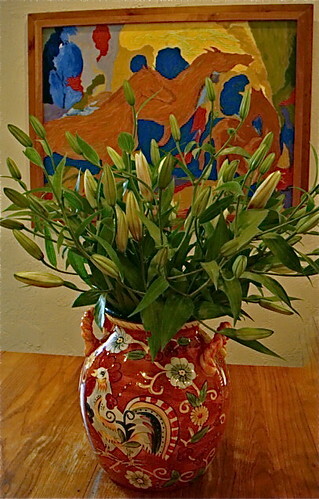 A few blooms had now wilted which I clipped… but the bouquet still looked great… downstairs. This was a hot day. 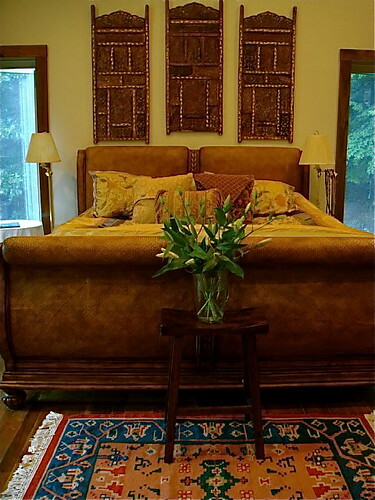 Our upstairs bedroom was hot. The flowers upstairs were in the full sun and all the white blossoms wilted. I moved the remaining blossoms to the arrangement downstairs. August 14, (17 days total) more blossoms had wilted but there were still plenty. All had now opened. Overnight more blooms dropped August 15 (18 days in total) I moved the arrangement to a smaller vase… still beautiful. 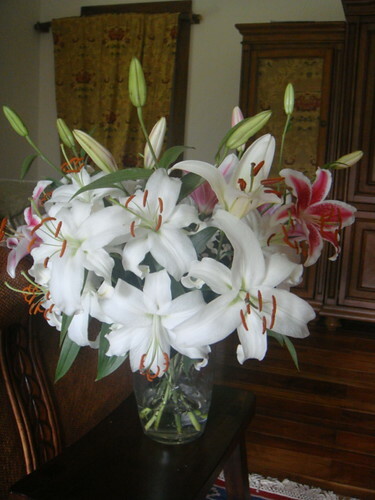 I expect these lilies to last two or more days.. for a total 25 days of beauty and exquisite fragrance. 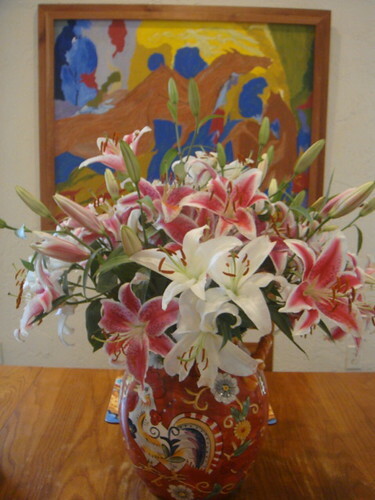 You can order Ecuador lilies and help Ecuador’s poor at the same time. 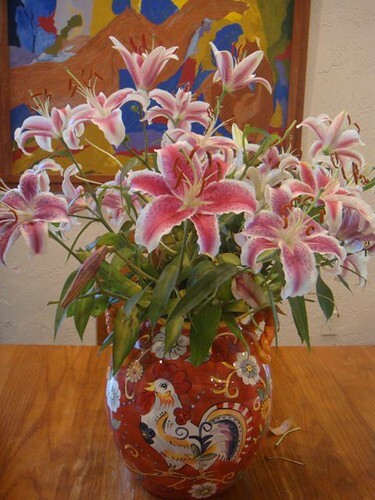 See how to order Ecuador roses or lilies and help the poor.